We are often asked when is the best time of the year to come to Maui and quite simply any month has great weather here. Low temperatures in the winter months average between 75-80 degrees. Summer months average 80-90 degrees. The Southwest side of Maui is a semi-desert so we average just 10″ of rain per year with December – February as the “rainiest” time of the year. Maui has been voted best island world-wide ( yes world-wide) with Expedia in 2016, Trip Advisor in 2106, and for 19 consecutive years by readers of Conde Neste Travel Magazine. No other island in the Hawaiian chain has received this honor. Maui is a very gay and lesbian friendly island. 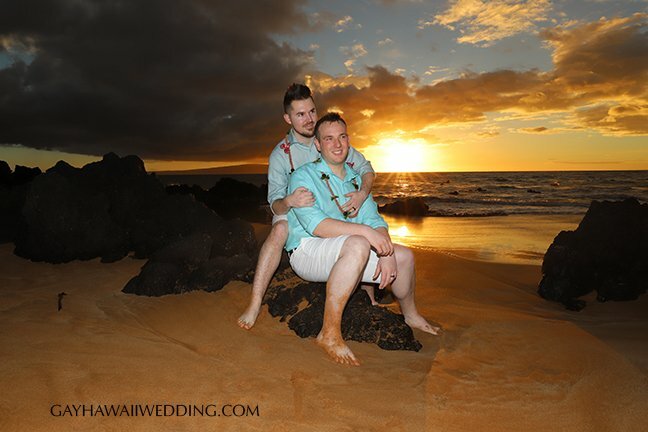 It is recommended you plan on arriving on Maui 2 days prior to the ceremony date. This allows for couples to adjust to the time-zone change, obtain a marriage license and relax a little before the ceremony. 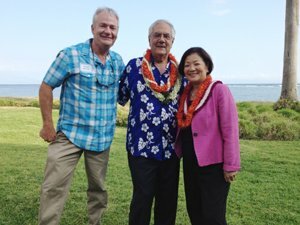 Hawaii’s marriage laws are very liberal. There is no waiting period, no blood tests of any kind, and the meeting with the State Marriage License Agent is less than 30 minutes long. All you do is complete a one page form, show legal photo ID (such as a driver’s license) and pay the Agent $70 cash. Please email us with any questions. 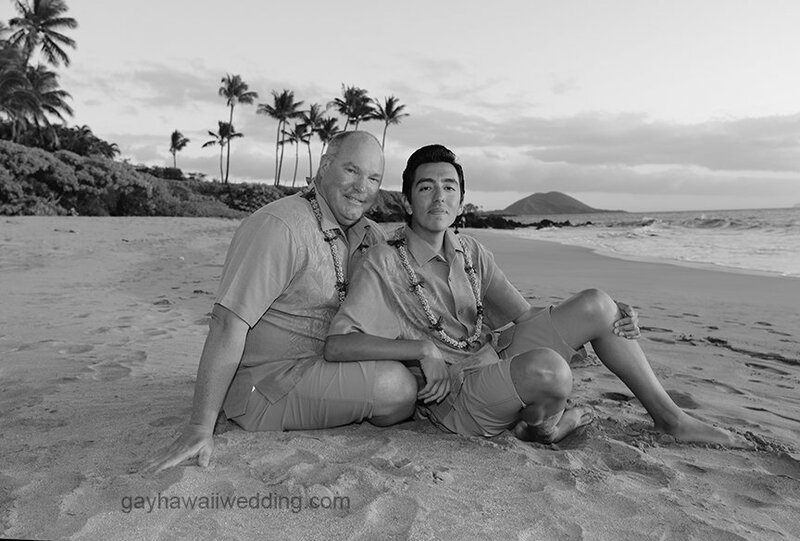 We plan and coordinate your Maui wedding, all you have to do is show up! Our Maui wedding location page details the locations for your ceremony site. The best beach we like to hold wedding and vow renewals on Maui is Poolenalena beach as it has a secluded side to it with no hotels around so the beach is much less crowed than other beaches. You can also opt to have your Maui wedding or vow renewal at your hotel or condo beach. We are asked frequently where to stay on Maui. Our hotel page details this question. Everyone loves our 5 star reviews of our oceanview honeymoon vacation rental apartment. We like the South west part of Maui which is Kihei, Wailea, Makena and Maalaea. This part of Maui is less touristy, has better beaches, and is closer to all the major attractions on Maui such as our 10,000 foot volcano that you can drive up to see. It’s awesome and is a must-see on Maui. The waterfalls on Maui are located on the East side of the island and is a nice side trip to see on one of your days here. We do not recommend staying on the East side of Maui as it rains frequently and is far from the other attractions here on our island. To see all there is to do on Maui. 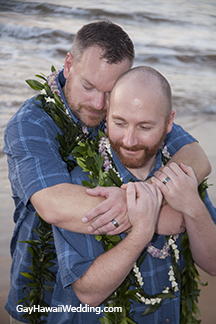 Gay Maui weddings are discussed on the website. Click here for gay wedding packages You can add or delete anything from the packages. Our philosophy is “it’s your wedding and you can have it any way you like”. The pricing of our packages has not been increased in over 2 years and we believe you can have a very nice memorable wedding without having to pay an exorbitant amount. Our pricing reflects this fair practice. We have planned and coordinated over 8000 weddings ( yes, over 8000) on Maui since 1994! Over the years we have learned how to make your wedding stress-free, fun, romantic, and elegant. Sometimes we are asked by potential customers why they should select us to handle their wedding instead of the hotel wedding departments where they stay. The answer is quite simple. 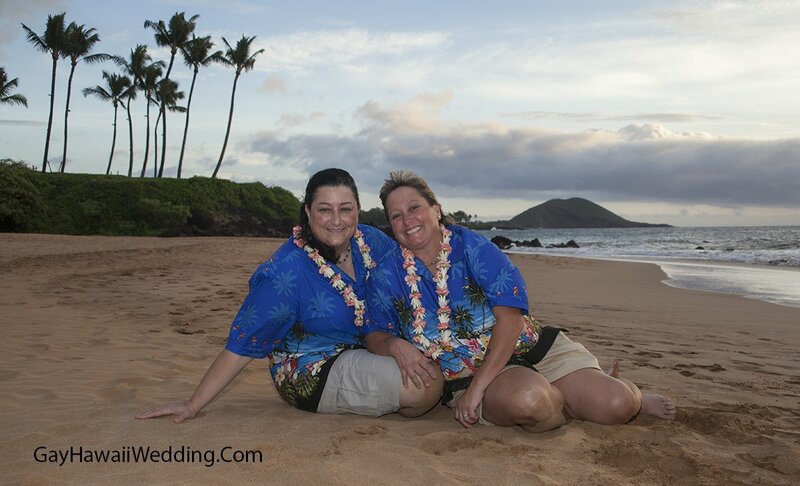 As an owner operated Maui wedding company we are experienced. Employees of hotels come and go and are not necessarily invested in making sure your wedding is successful. We are the ones that set the stage, that others follow. We know every beach, every hotel, every State license agent, the best restaurants and the ones to avoid. We can hold your wedding on the beach that fronts your hotel or condo as all Hawaii beaches are public and not owned by a hotel. Our Hawaii Wedding reservation process is easy. Just call us toll-free at 800-859-0072 during normal business hours. Our hours are 8:00 a.m. – 5:00 p.m. Hawaii Time, Mon-Sat (11:00 am -8:00 pm Pacific, 12:00 pm. -9:00 pm Mountain, 1:00 pm- 10:00 pm Central, 2:00 pm-11:00 pm Eastern ) You can place the deposit on a credit card. The deposit is 50% of the Hawaiian package price. The deposit is TOTALLY REFUNDABLE except $150 up until 30 days prior to the wedding date. The balance is not due until one day prior to your Maui wedding or vow renewal. Most couples are very happy with this policy because if you do need to cancel you are not out a lot of money.